Creates a barrier against bed bugs for up to 12 months. For preventive use as a residual barrier only. Once you have eradicated bed bugs using GreenTech Heat treatments, GreenTech Prevent can be sprayed on rugs, carpets, and upholstered materials like couches, beds and bedding, and other fabrics. This applied barrier can help prevent re-infestations which may be the result of a visitor who happens to bring bed bugs into the treated location, or if an untreated adjoining unit allows for a migration between unit that are being treated. GreenTech Prevent is an extra layer of protection against bed bugs after heat treatment. Proper application eliminates any remaining infestation and provides a residual effect which lasts for up to 12 months. How Does GreenTech Prevent Kill Bed Bugs? 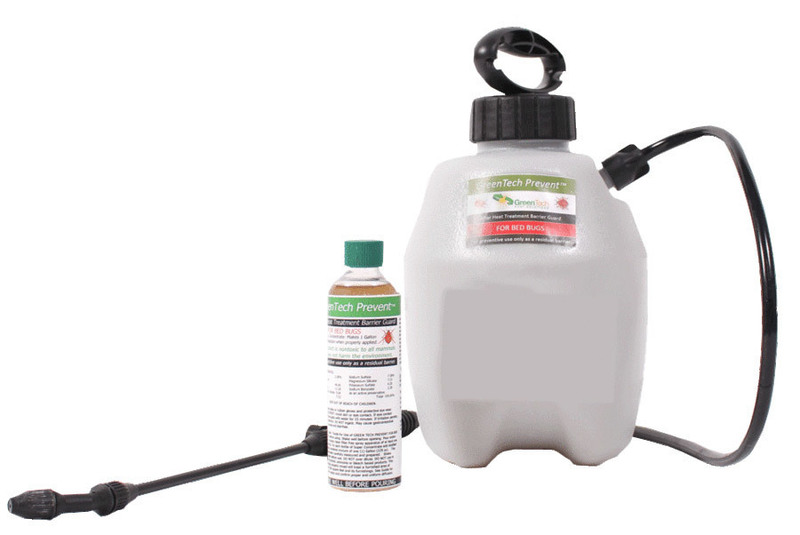 GreenTech Prevent is deadly to bed bugs. When sprayed, microscopic particles filled with the active are left behind. These particles become enmeshed in fabrics and other soft materials within the treatment area. As bed bugs crawl and disturb the particles, the active ingredient contained inside spills out and begins to emulsify, dissolving the waxy outer layer of the bed bug. GreenTech Prevent requires complete coverage of the target treatment area for maximum effectiveness. GreenTech Prevent is designed to be used in close proximity to human habitation and is intended to be applied to textiles and fabrics. Upon drying, GreenTech Prevent will leave a residual protective layer that will continue to eliminate bed bugs for up to 12 months from the date of application. GreenTech Prevent is bio-engineered to react as emulsifiers when either comes into contact with the chemistry of the bed bug’s outer waxy layer. This product is nontoxic to humans and other mammals because we lack the waxy outer exoskeleton of a bed bug. GreenTech Prevent is also odor free and hypoallergenic. When dry, it may leave behind a very light dust that may be visible on dark surfaces. This dust is easily wiped away with a clean cloth. GreenTech Prevent is nontoxic to all mammals. In some rare instances, some people may experience a mild drying of their skin when they come in contact with GreenTech Prevent. For this reason, we recommend that when you are preparing the product you follow the safety instructions, wear gloves and avoid direct contact with the product. Q: After a successful heat treatment, how long does it take to re-infest an infestation free area? A: Almost immediately. Bed bugs hitch hike on new clothing, furniture, boxes and people. A home that is free of bed bugs today could be reinfested with bed bugs tomorrow. Q: Can bed bug infestations be spread on the wheels of a housekeeping service cart or by a vacuum cleaner? A: Yes. Infested materials are one of the common contributors to reinfestation in the hospitality industry. Q: Can areas that are not currently infested with bed bugs be treated with GreenTech Prevent for prevention purposes? A: Yes. GreenTech Prevent is a great solution for dormitories, hotels, motels and other situations with high occupant turnover. Q: Will GreenTech Prevent stain? A: No, don't use on silk. Q: Will vacuuming remove GreenTech Prevent from a treated area? Q: Will shampooing remove GreenTech Prevent from a treated area? Q: What is GreenTech Prevent shelf life? A: 2 years unmixed or mixed. Mixing does not effect shelf life of GreenTech Prevent. Q: What do I do with product that I think may have frozen or that may have gotten too hot? A: When in doubt, throw it out. Normally, we will provide replacement at only the cost of shipping. Low-income housing, HUD and housing authorities, homeless shelters, governmental agencies, university student housing, senior housing, and multi-unit property managers also benefit from our bed bug heat equipment and training to eliminate insect pests and improve the living conditions for their residents. Apartments can be heat treated in a single day and certified as bed-bug free between tenants without fear of exposing tenants to additional allergens or toxic pesticides. Camps can treat an occupied cabin for bed bugs while the campers are away on a day hike. Our equipment will zapp bug and black widow with thermal remediation.